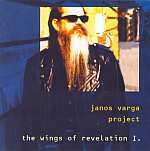 Review: "Janos Varga Project : Wings Of Revelation I" - Sea of Tranquility - The Web Destination for Progressive Music! O.K., O.K. I know we should be concentrating on recent releases with our reviews but this one slipped under the radar for way too long and therefore requires your immediate attention and action. Janos Varga, for those who were still in diapers when the Hungarian band, East were in their prime, leads a very accessible group of talented musicians on this rather incredible outing. Starting with a slow surging theme right out of the Pink Floyd school of better rock music, the band quickly shifts up a gear or two to introduce some stunning guitar that reminded me of Leslie West of Mountain fame together with some brilliant keyboard runs reminiscent of Manfred Mann's work with the Earth Band during the late 70's and early 80's. It's hard to ignore that phat synth sound that was so revered when progressive music was considered reasonably normal and to add the really accessible guitar flourishes injects a compelling magic to this CD that is absent from far too many albums these days. The main track, being the 19.39 minute epic, broken into 7 minor sections, is a stunning piece of song writing that answers all the critics and yet showcases that excessive flash and panache are no match for clever arrangements and well structured music that really shines in all areas. The track, "Matching Souls" is very reminiscent of something that a latter day Jade Warrior would compose if they had Steve Vai or Joe Satriani on board as their guitarist. The song is just incredibly beautiful and would not be out of place on the "Enchanting Guitar Melodies Archive" by VAI. It is certainly as good as anything on that compilation. All other songs are equally impressive. Sure, this is a totally instrumental album and you'd think that without any vocals, there has to be something missing or that too much self indulgent wankery is at hand. Let me assure you that each individual note, phrasing and piece of music that makes up this amazing collection of songs has been really carefully constructed to ensure this doesn't get lost amongst a sea of aspiring shredders who are only interested in extreme virtuosity. With a cross section of clever riffs, thundering bass lines, dynamic drumming and downright instant gratification after only a few spins, this has hardly left my player since I plonked down the hard earned moolah and bought my own imports of both this and the second release from 2002. Scorching lead guitar and awesome synthesizer abound throughout all songs on this record and being underpinned by the relentless rhythm section, has made for one of the best efforts I have heard in five years. There is just so much happening within each song that despite the lack of vocals, I found every section very memorable, covering more territory within 5 minutes than most bands cover in an hour of plod-along-till-we-get-bored drivel. Janos is certainly no limp-dicked six string slinger trying to carve out a name for himself. His brilliance is already clearly evident on the two most highly revered earlier albums by East called "Huseg" and "Jatetok" and with this admirable effort, he has propelled his name further into the stratosphere than most serious musicians could ever dream of. Any aspiring keyboard player should take note of how Janos injects so much melody and charm into his music and study his techniques properly if they want to make any inroads into the overcrowded world of progressive rock. Looking at the cover, you'd think Janos was one of the former members of ZZ Top but be assured; the man makes a total mockery of the efforts of some of the younger talent vying for your dollar these days. Needless to say, this outrageously brilliant album has my highest recommendation.